Everything That Swims: List of fish I've caught. List of fish I've caught. Freshwater: 1 Largemouth Bass, 2 Smallmouth Bass, 3 Black Crappie, 4 White Crappie, 5 Rock Bass (redeye), 6 Striper, 7 White Bass, 8 Yellow Perch, 9 Warmouth, 10 Redear, 11 Green Sunfish, 12 Redbreasted Sunfish, 13 Bluegill, 14 Hybrid Bluegill, 15 Longear Sunfish, 16 Channel Catfish, 17 Blue Catfish, 18 White Catfish (not albino channel), 19 Brown Bullhead, 20 Yellow Bullhead, 21 Common Carp, 22 Grass Carp, 23 Goldfish, 24 Koi, 25 Golden Shiner, 26 Common Shiner, 27 Spotfin Shiner, 28 Mountain Redbelly Dace, 29 Rosyside Dace, 30 Blacknose Dace, 31 Hornyhead Chub, 32 River Chub, 33 Fallfish, 34 White Sucker, 35 Hog Sucker (northern), 36 Stonecat, 37 Longnose Gar, 38 Chain Pickerel, 39 Brown Trout, 40 Brook Trout, 41 Rainbow Trout, 42 Tiger Trout, and the 43 American Eel. Freshwater fish that I haven't legitimately caught (snagged): Sea Lamprey, Gizzard Shad, and River Carpsucker. Saltwater: 44 Pinfish, 45 Spottail Pinfish, 46 Scup, 47 Mummichog, 48 Banded Killifish, 49 Spot, 50 Croaker, 51 Northern Sea Mullet, 52 Southern Sea Mullet, 53 Red Drum, 54 Black Drum, 55 Sheephead, 56 Spadefish, 57 Grey Triggerfish, 59 Greater Amberjack, 60 Amlaco Jack, 61 Black Sea Bass, 62 Cobia, 63 Summer Flounder, 64 Southern Stingray, 65 Clearnose Skate, 66 Smooth Dogfish, 67 Eagle Ray, 68 Scad Mackerel, 69 False Albacore, 70 Spanish Mackerel, 71 Jack Crevalle, 72 Florida Pompano, 73 Sea Robin, 74 Goosefish, 75 Begall (cunner), 76 Tautog, 77 Threadfin Shad, 78 American Shad, 79 Bluefish, 80 Silver Perch, 81 Spotted Sea Trout, 82 Grey Trout (weakfish), 83 Banded Rudderfish, 84 Pigfish, 85 Blue Runner, 86 Blackfin Tuna, 87 Dolphinfish (Mahi Mahi), 88 Striper, 89 American Eel, 90 Glass Minnow, 91 Needlefish, 92 Houndfish, 93 Ballyhoo, 94 oyster toad, and 95, the northern puffer fish. And snagged saltwater fish: White Mullet and Menhaden. 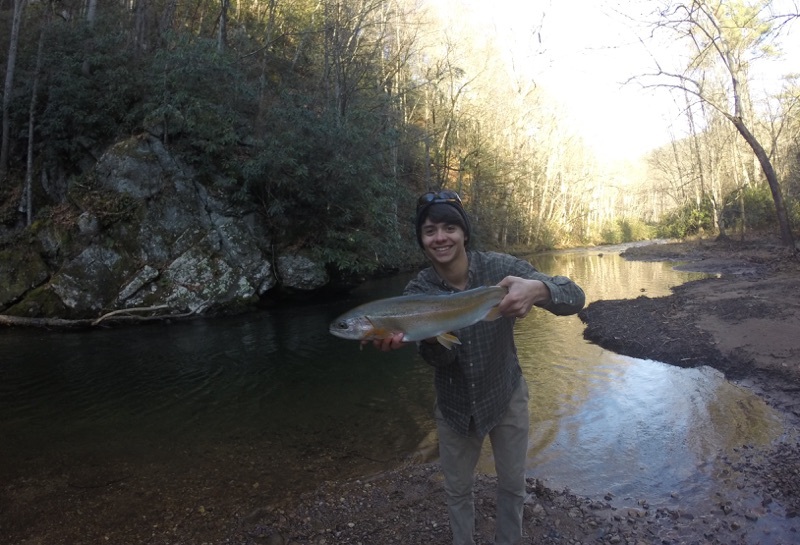 So technically, I have landed 100 species of fish on rod and reel, and I am probably leaving out a couple, but this was just a post I did for fun. And now I have a list I can add to as I catch more, so hopefully I can pass 150 in 2 or 3 years. Thanks for reading! Now I will be adding any new fish right here: 101 White Perch... 102 Palamino Rainbow Trout, if a Tiger Trout is considered a separate species, then so are Palaminos... 103, I discovered that bluehead chubs, a fish I have been thinking were river chubs/hornyhead chubs, are a separate species as well. 104, Spotted Hake. 105 Atlantic Sharpnose Shark, 106 Dusky Shark.